The Thermo Revco General Purpose Undercounter Freezer provides compact, easy to place storage for your everyday samples and supplies. This lab freezer has plenty of storage space with fixed height shelving, and a removable, slide out bottom tray, and in door shelves. The mechanical thermostat allows you to adjust the temperature between -12to -24°C. This -20°C freezer can be tucked away under a counter top, or on top of a bench. For maximum efficiency a minimum clearance of 4 inches in the back and 3 inches on the side should be observed to maintain proper air flow. 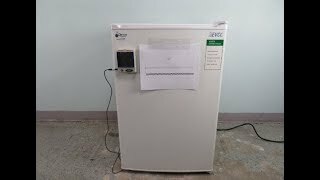 This handy lab freezer is ideal for a situation where exact temperature control and maintenance is not critical and no alarms are needed. The Thermo Revco General Purpose Undercounter Freezer uses CFC free R134A refrigerant. This Thermo -20°C Revco Freezer Model # REF417A15 has been fully inspected and is performing without issue. All of our lab equipment comes backed with our standard warranty. Should you have any questions, please don't hesitate to contact us.